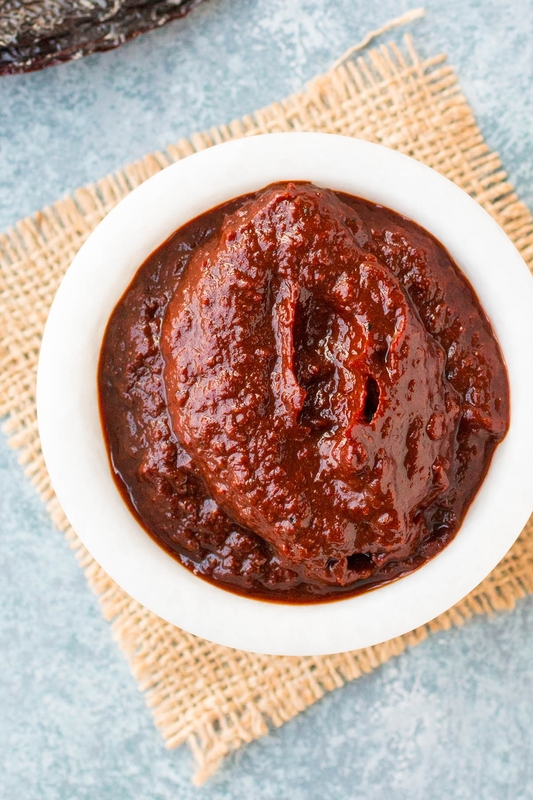 This easy-to-make red chili sauce recipe is a flavor POWERHOUSE and essential for Mexican or Tex-Mex cuisine, made with lightly toasted ancho peppers. Perfect for enchiladas, chilaquiles, tacos and so much more. OK, my friends. 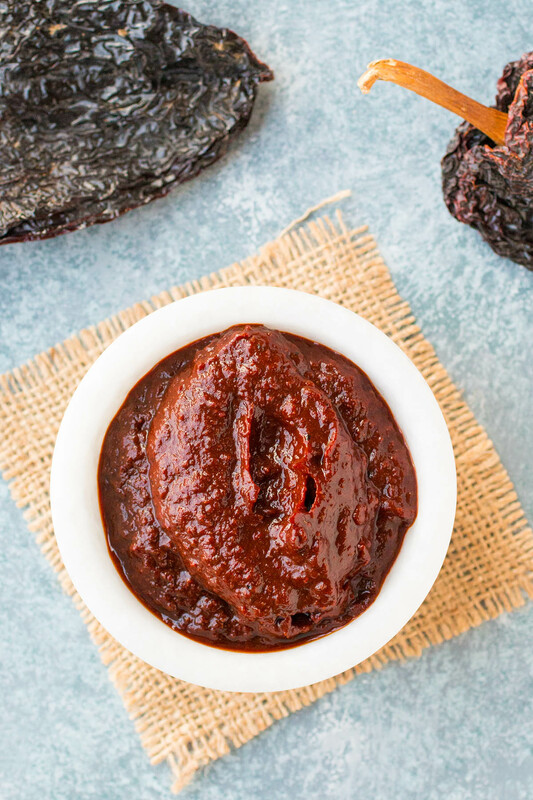 It’s time you started cooking with ancho peppers. Truly. If you’ve never cooked with these wonderful dried peppers, you are in for the flavor experience of your life. 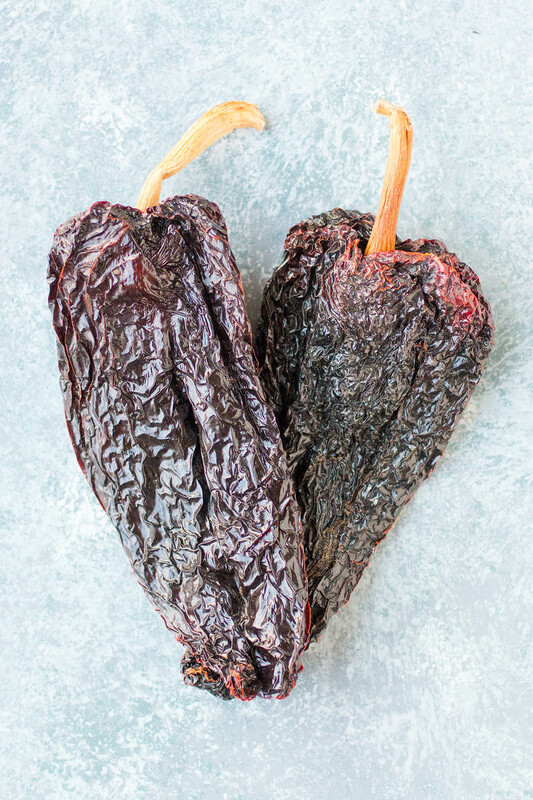 Ancho peppers are dried poblano peppers, and where poblanos have a deep, earthy flavor, ancho peppers take that depth and earthiness to a whole new level. You might not think sauces made from dried pepper pods could achieve flavors that transcend fresh pepper sauces, but dried peppers achieve a quality you can’t get with fresh peppers. I wouldn’t argue that one is superior to the other, but for me, both are essential in building big, bold flavors. It all depends on the dish. I believe food should speak, and speak LOUDLY. This sauce surely does. Your taste buds will hear this one! So let’s get to making ourselves a flavor bomb of a red chili sauce with ancho peppers, shall we? Aren’t they gorgeous? I used this ancho chili sauce recently in our recipe, Chilaquiles Rojos with Ancho Chili Sauce. That particular sauce incorporates extra tomato sauce to thin it out and build a bit more tomato flavor. I’ll talk about that below for ways you can thin out the sauce to make it more “saucy”. 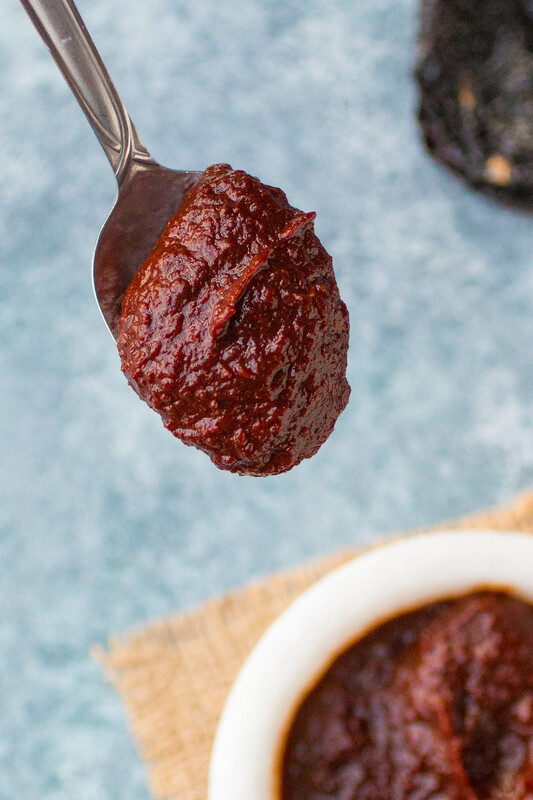 For me, I personally like to achieve more of a paste-like consistency of the ancho sauce, allowing me to either swirl it into soups or stews, thin it out with a bit of stock for a quick and simple ancho sauce, or add a bit of tomato sauce for a different version. First, heat a pan to medium-high heat and add your ancho peppers. Do not use any oil or liquid. You want to dry toast them. You CAN make this recipe without lightly toasting the peppers, but I urge you not to skip this step, as the dry toasting loosens up the oils in the peppers, resulting in richer flavors. Toast them a couple minutes per side. The peppers will puff slightly and the skins will begin to turn red. Next, set them into a large pot of boiling water and remove from heat. Let them soak covered in water for 30 minutes. As they soak, the ancho peppers will begin to leech into the water, darkening it in color. 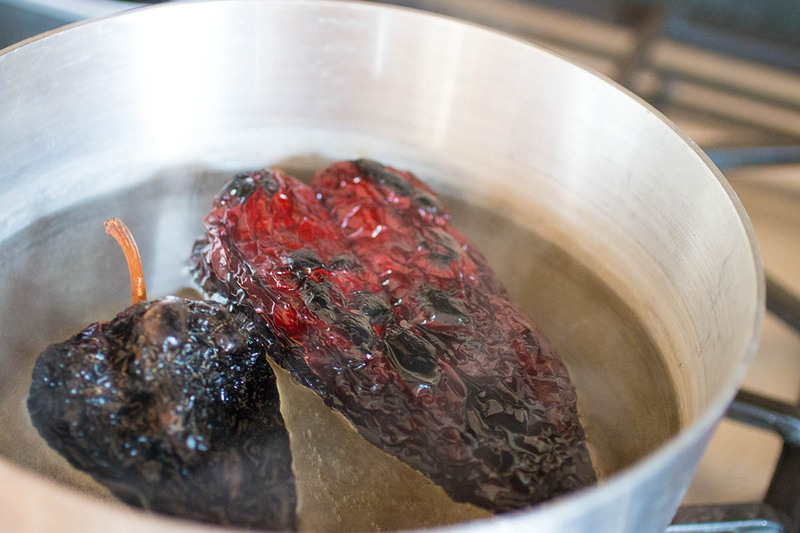 This soaking water has a lot of nutrients in it, so do not throw it away for now. Remove the stems and coarsely chop the anchos. Reserve that valuable soaking liquid. Set the chopped anchos into a food processor. Next, heat the oil in a pan to medium heat and cook down the onion, garlic, and tomato, then add them to the food processor along with the vinegar, cumin, oregano and a bit of salt and pepper along with about 1 cup of the soaking liquid. Process until it smooths out. The ancho sauce will be thick at this point. You can add more soaking liquid to achieve your desired consistency. Or, as an optional variation, thin out your sauce with tomato sauce for more of a tomato flavor. You will still get the powerful ancho flavor. Next, give your ancho chili sauce a taste. You can adjust with salt and pepper and this point, and if you feel it needs a touch of sweetness, add the honey and process a bit more. Finally, press the sauce through a coarse strainer into a bowl. I use a wooden spoon to push it through. This removes the solids and bits of rough ancho skin that didn’t get processed. The result is rich, deeply red chili sauce that, frankly, will knock your socks off. This is great stuff, my friends! I am IN LOVE with this sauce, both version – with and without extra tomato sauce added in. You can easily add in other flavors that you prefer. I recommend trying this with fresh cilantro. Truly, amazing. If you’d like a creamier version, add crema our sour cream. So, so good. 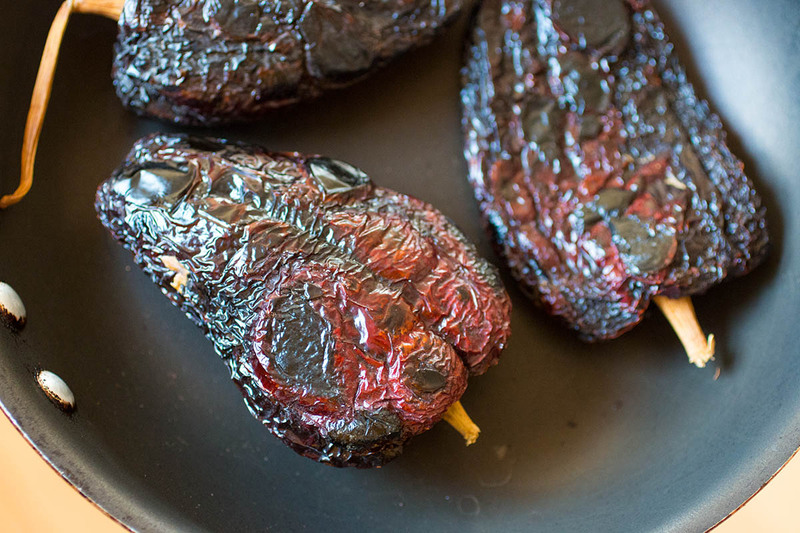 Dry roast the ancho peppers on a hot pan about 1-2 minutes per side. The peppers will puff slightly and the skins will begin to turn red. Set them into a large pot of boiling water and remove from heat. Let them soak covered in water for 30 minutes. Heat the oil in a pan to medium heat and add the onion. Cook about 5 minutes to soften. Add the vinegar, cumin, oregano and a bit of salt and pepper along with about 1 cup of the soaking liquid. Process until it smooths out. The sauce will be thick at this point. You can add more soaking liquid to achieve your desired consistency. Press the sauce through a coarse strainer into a bowl. I use a wooden spoon to push it through. As a tasty variation, add up to 15 ounces (1 can) of tomato sauce while cooking, or after you strain the ancho chili sauce to simmer. It makes for an outstanding final sauce. Or, swirl in anywhere from 1 tablespoon to a cup of the ancho chili sauce to tomato sauce to liven up any dish. Heat Factor: Mild. There isn't any real HEAT here, just outstanding savory flavor. I’m anxious to try this. I really like the ancho chili flavor, but it seems as often as not any sauce I make with roasted ancho chills tastes bitter. Do you have any tips? Alan, there is a slight inherent bitterness with anchos. Try removing the seeds before using. Some people report a bitterness with the seeds. You can also add a sweetener, like honey or sugar. Brittany, yes, this should freeze just fine. Enjoy! Awesome recipe! I did a hot sauce interpretation with some extra vinegar and a small can of chipotles in adobo. Tastes amazing right after making it, but gets even better over time. I’ll be making more for sure. Awesome, Adam! I love it! how long will this last in an airtight container in the fridge? REPLY: Banky, this will keep a couple weeks easily, up to a month. — Mike from Chili Pepper Madness.